Field Audit—a field audit is done at the taxpayer’s place of business. The taxpayer, however, can request a change in venue for the audit. Frequently, the request is to have the audit done at the taxpayer’s CPA’s office. The request is usually granted. By having the audit offsite, there is less disruption to the business. However, the IRS still reserves the right to visit the taxpayer’s place of business. 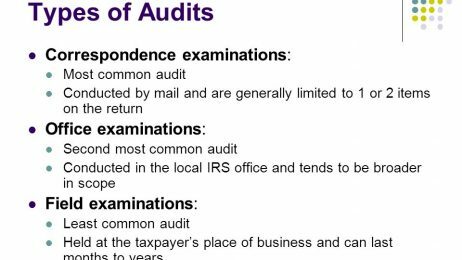 Office Audit—an office audit is conducted at the local IRS office. This type of audit typically involves one or two items on the return that may be in question. You will need to bring all of your books and records to the IRS office.